What Are the Benefits of Giving Up Coffee for Green Tea? Andrew French graduated from the Canadian Memorial Chiropractic College in 1999 and began writing about nutrition shortly thereafter. French has contributed health and nutritional related articles to the "Calgary Mirror," "Calgary Herald," "Rocky Point Times" and "Ajo Corridor Times" newspapers, as well as "Penasco" magazine. Aside from water, coffee and tea are likely the two most commonly consumed beverages in the world, and both have deep traditions in many countries. 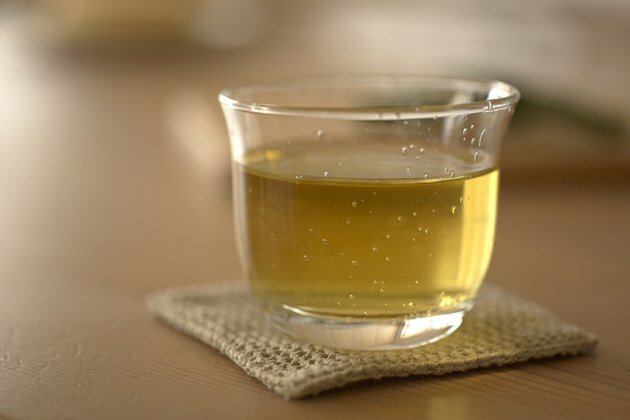 The United States was arguably more of a coffee drinking nation for most of the 20th century, but there are now many other tasty options that are largely mainstream, including green tea. The main benefits of switching from coffee to green tea are related to caffeine content, acidity and antioxidants. One of the main reasons why people are so habitual with their coffee and tea drinking is the addictive properties of caffeine. Caffeine doesn't actually increase energy levels -- although adding sugar or milk to beverages can -- but it does increase brain activity by triggering more neurons to fire. The result is higher cognition and a greater degree of alertness. The downside is that caffeine is addictive and can lead to headaches, restlessness, anxiety and insomnia, according to the Mayo Clinic, so 500 milligrams per day is typically considered the maximum amount that adults should consume. Caffeine in coffee varies widely, but a typical brewed 8-ounce cup can contain up to 200 milligrams. In contrast, the same amount of green tea usually contains less than 40 milligrams of caffeine. Green tea also contains L-theanine, an amino acid that seems to reduce some of the negative effects of caffeine. While the caffeine in coffee can make you feel jittery, its relatively high acidity can lead to stomach upset and abdominal pain. Coffee contains a variety of acidic and bitter compounds, such as chlorogenic acids, aliphatic acids and tannins. The pH level of coffee hovers around 5 -- lower pH values are more acidic -- whereas green tea typically has a pH level greater than 7, which means it is alkaline. Aside from its acidity, there are other compounds in coffee that can cause gastrointestinal irritation and loose bowels. While not everyone reacts positively to green tea, alkaline beverages are usually easier on the stomach compared to acidic ones such as coffee. Both coffee beans and tea leaves contain beneficial antioxidants, but most varieties of green tea contain more antioxidants than ground coffee contains. Antioxidants are especially important for cardiovascular health because they destroy harmful free radicals and protect tissues, including blood vessels. The most potent antioxidant in green tea is called EGCG, which is a type of polyphenol that may also protect against certain types of cancer, according to The Huffington Post. There are many other benefits related to giving up coffee for green tea, including fresher breath, increased metabolic rate, enhanced fat burning, boosted immunity, improved memory, better blood flow to the brain, reduced risk of numerous diseases and less pain from inflammatory conditions such as arthritis, according to a 2012 Daily Mail Online article. The Coffee FAQ: Coffee and Health: Is Coffee Acidic? Is Black Coffee Good for You? How Much Caffeine Is Contained in a Tea Bag?